Shah Rukh Khan, who is celebrating his 52nd birthday today, had a blast with his close friends and family members in Alibaug on his birthday eve. But, someone else also celebrated her birthday and blew candles with King Khan. Yes, she's none other than Sanjay and Maheep Kapoor's daughter Shanaya Kapoor. Nothing could have been better for Shanaya than to celebrate her 18th birthday with Shah Rukh Khan. The doting parents - Sanjay and Maheep Kapoor, who were also a part of Shah Rukh's Alibaug celebrations, posted a couple of beautiful pictures with heartfelt messages for Shanaya. 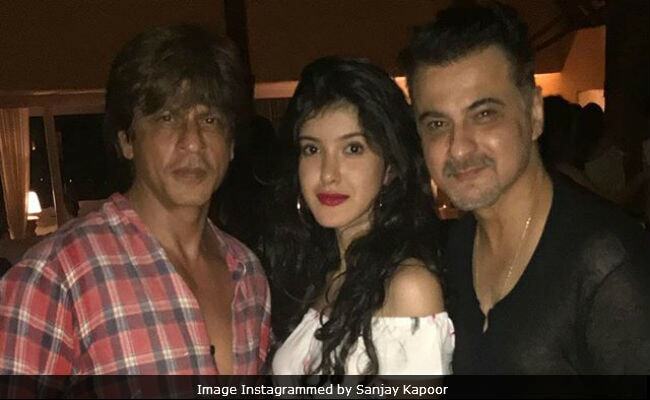 In one of the pictures, Shanaya poses with the Baadshah and her dad Sanjay Kapoor while in the other Shanaya is sandwiched between her parents. Shanaya had a ball at her birthday celebrations with BFFs Ananya Pandey and Suhana Khan. The trio are often spotted partying at different places in Mumbai as well. Karan Johar, who was an obvious guest at the party, posted this picture, in which Sussanne Khan is accompanying the girls for a perfect picture. Shanaya's cousin, who could not attend the bash in Alibaug, sent her best wishes via social media. Yes, we are talking about Shanaya's uncle Anil Kapoor's daughter actress Sonam Kapoor. Sharing the adorable picture, Sonam wrote this message with a heart emoticon: "Happy 18th Shanaya! Hope you have a fabulous day and a more spectacular year ahead. Sending you tons of love." The Kapoors and the Khans had a time of their lives celebrating Shah Rukh and Shanaya's birthday eve. Stars like Farah Khan, Farhan Akhtar, Deepika Padukone, Alia Bhatt, Sidharth Malhotra and others joined the birthday bash. We wish Shanaya and Shah Rukh a very Happy Birthday!